Jeanette Kennedy Whaley was born on November 3, 1928 to the late James Kennedy and Julia Boyd Rumph. 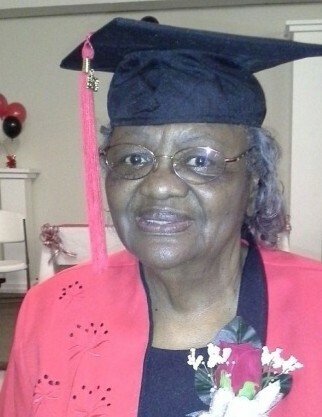 She enjoyed a childhood centered about family in the Midlands with lots of love and laughter. Jeanette was educated in Richland County Public Schools and married shortly thereafter. Mrs. Whaley was always a hard-working woman. She enjoyed careers in domestic work, tailoring, and healthcare; she could cook, clean, sew, and tend for the sick better than most who have ever received public accolades for the same tasks! In fact, that penchant for all things excellent served as a beacon for her life’s endeavors. Mother Whaley, as her church family refers, was fortunate to find a remarkable love in her late husband, James Whaley Senior. They enjoyed decades of happiness raising children and spoiling grandchildren. However, there is nothing that surpassed her love for Christ Jesus and the power of His Word. She proved that dedication when she was honored as the top Bible Scholar after completing a rigorous course of study. “Gramps”, the term of endearment pinned by her grandchildren, enjoyed hearty laughs and smiled frequently at her own uncanny wit. She was smooth like a baseball pitcher slow-rolling a baseball across the mound with her humor. That essence of her remained even in her final days. The hallmark of her brand of caring always included a compassionate ear, a warm embrace, and a firm word from the Bible. Mother Whaley modeled self-less service and sacrifice while she cared for her disabled sister her entire life as well as through the care she rendered to her husband during his extended illness. Yet, she always found time to serve her church family through the Rehoboth Missionary Society, The Mother’s Board, and The Senior Choir. Mother Whaley was dearly loved, and her presence will always be appreciated. Mother Whaley was preceded in death by her sisters, Ruby Rumph and Thelma Rumph Dawson; brother, Moses Kennedy; son, Thomas Jacob Hopkins; daughter, Sharon Hopkins Thomas; and grandson, Cornelius Harvin. Mother Whaley leaves to cherish her memory her children, Betty Nathan of Gaston, SC; William (Janett) Nathan, Brenda Diane Nathan, Cynthia (Abraham) Brown, Ronald (Gail) Hopkins, all of Columbia, SC and Evangelist Julia Harvin of Rembert, SC; her step-children, James Whaley Jr. and Sophie Mae Wheeler; her siblings, Willie Mae Rumph, Wilton Earl (Barbara) Rumph, Tommy Rumph, Elizabeth Jones, and David (Teresa) Rumph, all of Columbia, SC; 20 grandchildren; 34 great-grandchildren, four great- great grandchildren, and a host of other relatives and friends.